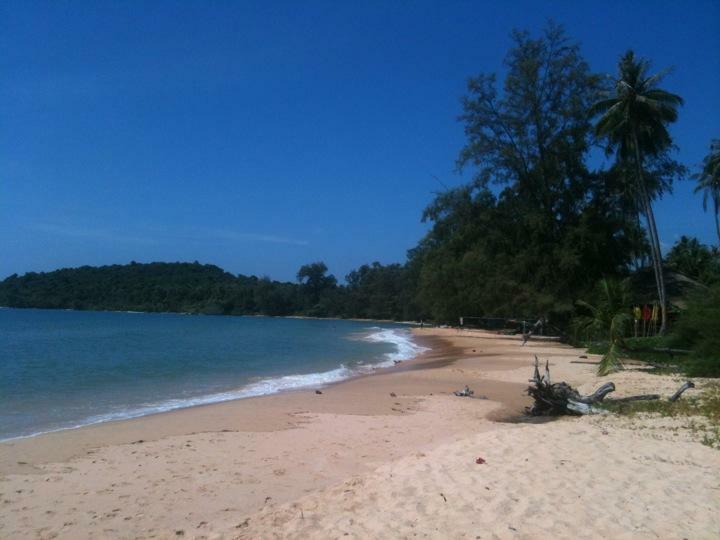 When we stepped off our bus in Sihanoukville we were a long way out of town. To save some money on the expensive tuk tuks we opted for a moto each. A scooter that is now holding myself, the driver, my big bag, my small bag and a green bag we've been using to carry around extras. After a 10 minute journey weaving in and out of traffic we both arrived at our hostel (Hibiscus Garden) in one piece. We check in and drop our stuff off in our garden bungalow before we headed out for some food at a nearby restaurant. By this time it was mid afternoon and we were able to take advantage of the early bird menu and get a starter and main for $5. I still wasn't feeling 100% but haven't eaten anything all day so tried tapas and mango chicken. In the evening we walked around the area (serendipity beach) checked out the beach and beach front bars and BBQs as well as looking into trips and onward travel. We didn't have a late night and before we went to bed tried to set up a mosquito net over the bed without much success (it was laying against our faces. So not much protection from the army of mossies flying about). This was our day of getting everything sorted in the morning then relaxing on the beach in the afternoon. It all started off well. We went and got our washing done, I bought some flip flops which due to the heat (36 degrees C) had become essential. We then needed to book flights for Christmas as we discovered that all the train tickets had sold out. This is were the plan fell down. The flights had increased in price since the day before for a start, then we went through the AirAsia mobile site and just as it got to confirming our booking, the screen went blank and wouldn't load. So begrudgingly we had to start all over again. This time when it confirmed it said "error - duplicate order" then told us to ring a specific department without giving us a number. We Googled AirAsia customer service and found a few numbers. None of which worked. We needed to get hold of them as we didn't know whether our order had gone through as it wouldn't let us book again. Would we be charged twice? We tried Internet cafes and phone booths. Nothing got through. I then tried email and Facebook. By this time the entire afternoon had gone and extremely frustrated we went to the beach for a swim and a drink. Maybe not the best idea when you're still ill. (Alicia: Whilst I was out swimming, I made friends with two Cambodian boys around 8 years old and had a great time. The sea around serendipity was really calm and lovely as dusk started to set in, which was nice after all the faffing around we'd done that morning). We ended up with 2-4-1 cocktails at a nearby bar. Followed by a lengthy search for food. One place we tried the kitchen was closed, another we stopped at didn't have anything available that we wanted on their menu (we got down to our third choice meals and when they said "that was off too", we left). In the end we went back to the restaurant we visited the day before but had missed the early bird menu. All in all, not a great day. We started the day as we finished the last. Trying the issues with flights. After more phone calls, emails etc we finally got a reply that concluded with us having to buy the tickets for a 3rd (but final) time. With Christmas now sorted we could relax. We took the opportunity to grab a tuk tuk and headed over to a nearby beach called Otres. The beach was a lot nicer than Serendipity. There was a significantly decreased amount of beggars and hawkers, the beach was cleaner and there was less people. We used a free sun bed for most of the afternoon, got a few fruit shakes and soft drinks, grabbed a snack from a beach front restaurant before haggling our way back to our hostel via tuk tuk. If we were going back there again we'd definitely stay in Otres. We woke up early, packed a small day bag then checkout out of our hostel. We got picked up at reception and headed down to the pier as we'd booked onto a day trip that would take us to a nearby island. We had a breakfast of egg and bread on the pier in the sun whilst we waited for our boat to leave. An hour or so later we jumped into our traditional style boat and headed out towards an island off shore. There we put on snorkelling gear and jumped in. Alicia was happy as she got a chance to build on the confidence she found in Cairns and they had all the equipment (floatation vest, good mask and snorkel) to make her feel happy swimming around. The water was pretty murky but we still saw some fish amongst scatterings on coral. It had nothing on Australia but it was nice to get in the water as the day was already heating up rapidly. After we headed to our destination on Bamboo Island. This was where our trip differed from others. We took our stuff and left our group and headed through a small trail (uncut or marked but worn by people who walked it) through fields and jungle (in flip flops) to the other side of the island. There was some small, basic beach huts, common area that doubled as a restaurant/bar area and a toilet block, but that was it for the entire side of the island. We didn't have anything booked but took a chance they'd have a room. There was plenty of space from a dorm made of only hammocks, a small hut off the beach or a beach fronted hut. We went for the more expensive $15 bungalow on the beach. Great choice. We walked down to our own cabin that had 2 hammocks hanging outside made of old ripped jeans. Inside was literally only a bed and a mosquito net, the windows were holes in the wooden walls, the roof was dried palm leaves and didn't actually meet the walls. It reminded us a little of La Hesperia. Perfect. After we checked in we headed back along the trail to the beach to meet back up with our group. There we arrived just in time for a BBQ where we had chicken, rice and fruit. Unfortunately after I started to not feel quite so great but it didn't stop us from relaxing on the beach, seeing the boats come and go with people swimming in the shallow water. We eventually watched as our the day trip boat left and we headed back to our hut to relax in the hammocks and read as well as take a swim in the warm, clear waters. We were able to swim together which was a novelty too (normal one of us was out watching the stuff as we took it in turns to go in the water). We relaxed on the beach and went for another swim just as the sun started to set before getting out and drying off. By this point, I was starting to feel a little feverish and sick again so by the time we went to dinner I wasn't really up for eating but gave it a good go from a limited menu (we both had stirfry). We relaxed in the bar area for the rest of the evening talking to a dutch woman. Alicia had a beer and a sprite (crazy party with shandy!) and I had a couple of cans of fizz. Alicia headed to bed and I stayed up to charge my phone (electricity was limited to only a few hours so I had to make the most of it) and whilst using the plugs in the bar area the local workers started a heated game of beer pong which was entertaining. By the time I got to bed, Alicia was reading with her head torch. It was a crap nights sleep. The room was extremely humid, we were subjected to many noises we weren't used to (jungle, sea etc) and we were both feeling like arse. Around 3am to add to it a thunder and lightning storm passed over head, but without any rain. (Alicia: all I could think was "its a tsunami!") So we both got up and stood outside watching it for a while. It was pretty cool actually, to be stood on a deserted beach in the middle of the night watching this go on. Checkout was early the next day (9am) so after not a great deal of sleep we dragged ourselves up and packed. We headed over to the bar area to try to eat some breakfast. Before laying on the benches and falling asleep for a few minutes. After breakfast we headed all the way to the beach - all of 3 steps. Accompanied by a local dog, we sat under the shade of a large tree and relaxed. At 12:30, we headed over to other side of island to swim in the shallow water. Alicia did really well, she conquered her fear and treaded water for the second time (the first time was accidentally on Fraser) and swam around in the deeper water for a bit. We swam for about an hour, before leaving at 1:30 (picking up the tour were we left off). The boat ride back felt lengthy due to the scorching heat. After we were all baked, burnt, sweaty and exhausted they stopped the boat for a chance to have a quick snorkel again - Getting in the water felt like a great relief although when I dove in the water the strap holding my snorkel snapped and floated into the murky water below. In an attempt to rescue it I tried to free dive to the bottom but ran out of breath. Returning to the surface the current had taken me under the boat which I promptly smacked my head on (and later discovered had cut). The guide who was snorkelling managed to find it luckily though. The actual snorkelling wasn't speculate at all, the water was cloudy and if you could see anything it was a forest of seaweed and sea urchins. Just being in the water was great though. When we got back, we picked our stuff up from our hostel and tried to eat something in the restaurant next door before getting picked up to get the lengthy night bus to Phnom Penh (5 or so hours) then on to Siem Riep (another 6+ hours). The bus turned out to be ok. Despite not feeling great and the toilet being locked, the beds were in a strange set up. In sets of 2. So me and Alicia got to sleep in effectively a tiny double bed which made our stuff feel a lot safer than on other buses.